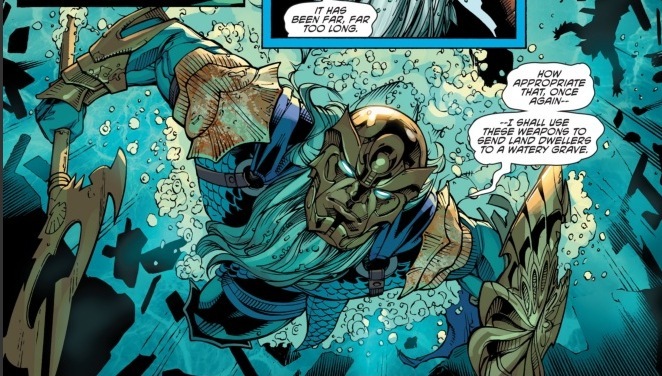 Aquamans story continues on in AQUAMAN AND THE OTHERS FUTURES END this week. The sea below and the Earth above are still not seeing eye to eye as Aquaman and his friends try to reason for peace between the two worlds. 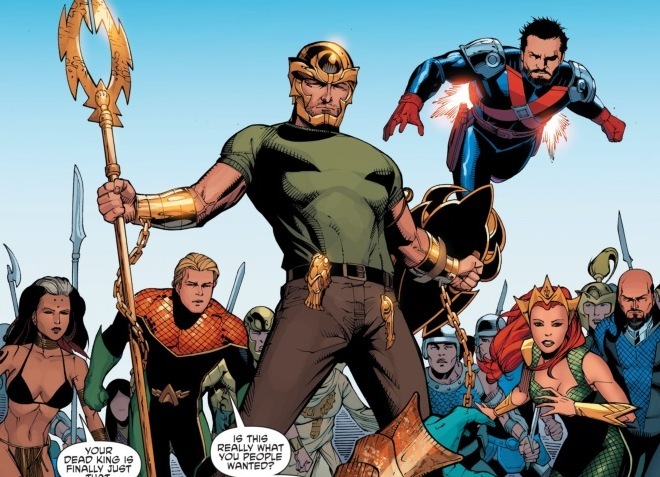 With Futures End jumping stories five years ahead, Aquaman’s story continues on with Arthur calling on the help of his friends. The story line was still a little sketchy, jumping up and down as the arc went along. 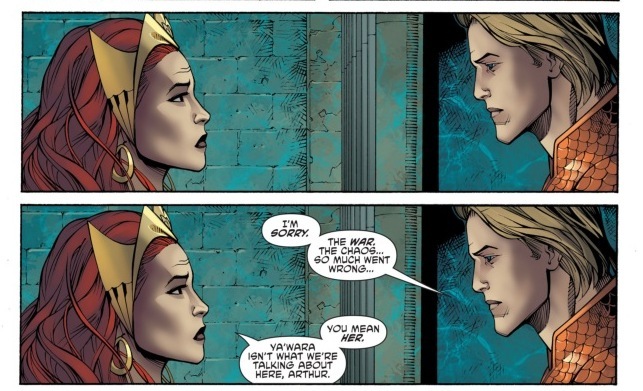 The war between the Atlantis and the surface world resembles a sibling rivalry. Neither thinks they are wrong and fight each other like a young brother and sister. 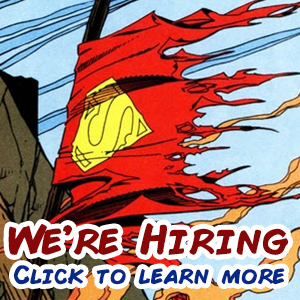 The endless war has now ended with the death of the King but in AQUAMAN AND THE OTHERS, is this the end of the comic and now all we have is the five year fill? Nothing was directly solved by the issue and it felt like it was just an excuse to kill off the super villain once and for all. Sean Chen has brought back the splendor of the art that was missing from some of the previous issues. With extremely realistic characters and intricate backgrounds, he has done a wonderful job at giving the comic a very mature edge. The missing golden sheen to the armor has also returned. 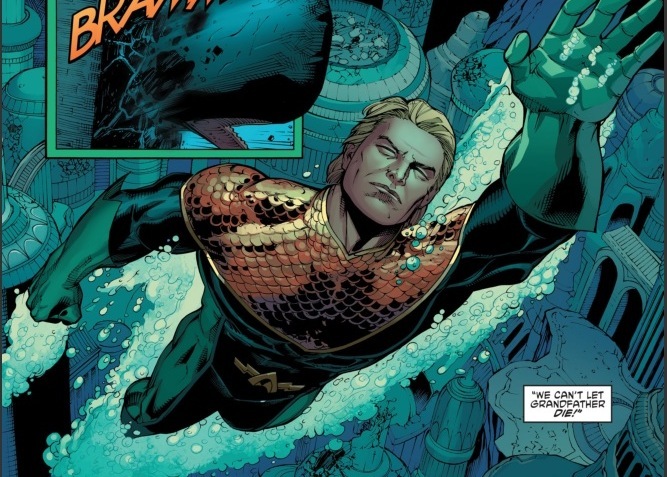 Matt Milla gives the pages that glittering gold that screams Aquaman in all this fantasy. The story has an ethereal tone so why shouldn’t the artwork resonate that which is what Matt Milla has achieved. The artwork that has anything to do with Aquaman is always stunning. I think they saved the best artists for his books because everything always looks beautiful above and below the ocean. 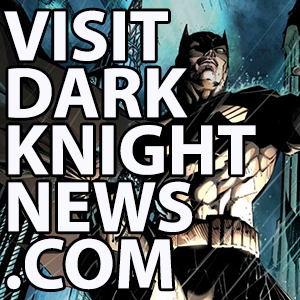 This week’s issue had a good amount of action jumping across the pages. There was a balance between the fight scenes and dialogue which flowed across the panels much better than previous volumes. 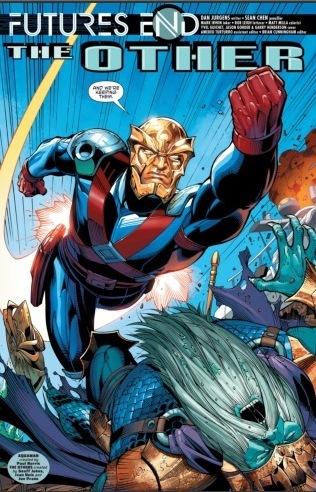 The war between both sides was well executed from both areas and each character showed off their skills as Atlantians and Aquamans surface were finally aired. A few negatives were present in the issue and the first was the spaces around the panels. The huge amounts of white sometimes kill the awesome vibe in the artwork and also wastes space that could be filled with some interesting details. Also the change in Aquamans character isn’t something the sticks well. As a man of the sea and fighting for his people, he has now all of a sudden switched sides. His passion has shifted from Atlantis and his Queen of the sea to the land and the love of his friends. It feels like they built up his sympathy for the ocean world only to wash it away with the return of a frequently reused villain. 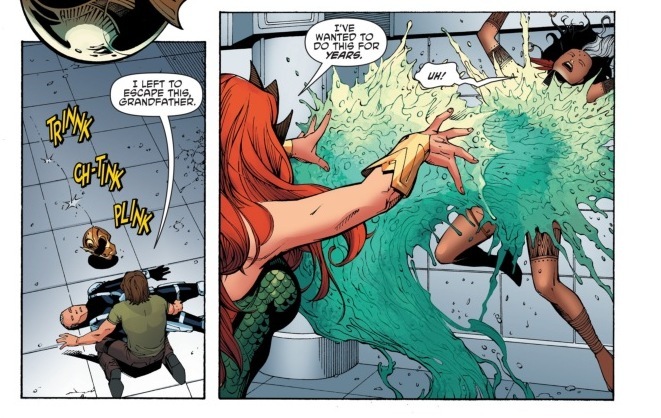 Aquaman was born for the water and that is where he should be. Keeping the Atlantian Relics on land also felt strange, definitely a fish out of water on that idea. Perhaps one as a symbol of faith would have been fine but as pieces of the sea, that power should stay within its sacred waters. 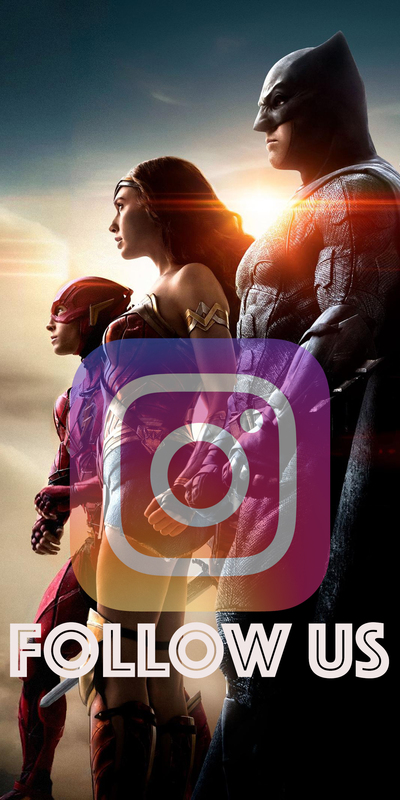 AQUAMAN AND THE OTHERS is mending the bonds from land to sea as they fight for peace. A new adventure for both worlds, we now have to wait and see if Aquaman will go back to his kingdom below or stay his home above.